Just over 350 years ago, Fellow of the Royal Society John Evelyn answered a query from the Navy, on assuring of the supply of timber to build ships, by writing one of the first books to engage with ecology and what we might now call sustainability. In the 17th century, our ancient woodlands fuelled domestic and industrial furnaces in the nascent glass industry, as well as providing the building material for the sea vessels the Navy needed. Evelyn understood that alongside these competing needs for wood as a resource for burning and making, there was a value in forests for themselves: thaumazein – wonder at the awe of nature. Evelyn’s book, Sylva – A Discourse of Forest-Trees and the Propagation of Timber – was published in 1664 and remains one of the most influential books on Forestry ever published. Wood is still an important material and forestry remains an important industry for the UK. Forests also provides a range of other benefits alongside materials and thaumazein, including flood mitigation by taking up excess water in catchments, ‘slowing the flow’, and absorbing carbon from the atmosphere. S1 Analysis-ready data scene commissioned from Environment Systems. 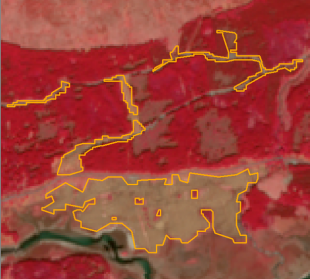 Earth observation data like this forms the basis for this forestry monitoring proof-of-concept. There is an extensive monitoring programme to maintain a picture of the overall extent and condition of forests, and how these are changing. Some aspects of monitoring will always require physical visits, but increasing use is being made of satellites to spot potential changes and use this information to better target these physical inspections. Current methods make use of more traditional visual spectrum data but this relies on the skies being clear when the satellites pass as the signal does not pass through clouds. However, the Sentinel 1 satellites carry a sensor known as Synthetic Aperture Radar (SAR) and the signal from this can pass through clouds. The data from this gives a measure of the height, shape and roughness of the earth’s surface and while it is currently little used it should be possible to use it to detect changes in tree cover. Detection of loss of trees as a result of storm damage – a single storm can cause perhaps half a billion pounds worth of damage to tree stocks. If the loses are identified quickly the wood (and much of the cost) can be recovered; six months later the trees are virtually worthless. Illegal tree removal – on occasion individuals remove trees from forests without permission and in some cases, such as ancient woodland, this loss can be irreplaceable. Again early identification of a problem could help mitigate before too much damage is done. Reducing monitoring costs of planting young trees – due to their broader value, grants are available to plant young trees and inspections are required to check the recipient has delivered what is required. It may be possible to detect the presence of young tree, thus negating the need for a field visit. This demonstration project will use aspects of the others to pull in geographic data and cleansed data from satellites and explore how the data could be automatically processed to identify areas that should be investigated further. Working closely with Forest Research it will initially focus on detection of young trees because this is the hardest change to spot so will really give a good feel of what is possible. Watch this space to see whether it is successful or not. Read more about the International Day of Forests (#WorldForestDay).